Resource center How Addictive Is Ativan (Lorazepam)? Are There Health Risks of Long-Term Ativan Use? Ativan is a drug in the benzodiazepine class – a group of drugs including Xanax and Valium that are often used to treat anxiety and panic disorders, sleep issues, and other illnesses. These medications first appeared on the market in the 1960s as an alternative to barbiturates, which had come under criticism for their tendency to cause dangerous overdose. Though benzodiazepines (benzos) are considered to be safer, they are still addictive drugs that can cause a range of health problems, especially due to long-term use. Due to the fact that drugs like Ativan easily result in tolerance and tend to cause both physical and emotional issues after an extended period, they’re only recommended for short-term use. Unfortunately, anxiety disorders and insomnia are not frequently short-term problems. Even if doctors stop prescribing Ativan after a few weeks, people may try to self-medicate by obtaining the drug illegally or may seek out other doctors to get more. The longer benzos are used, the more likely someone is to develop an addiction. Others may simply abuse drugs like Ativan for the high. Benzos can create feelings of peace, happiness, calm, and even mild euphoria at high doses. The increasing availability of these drugs has contributed to the popularity of taking them for recreational purposes; many people can get them from friends or out of family members’ medicine cabinets. Around 62 percent of teens say they misuse these drugs because they’re easy to get from their parents. This kind of abuse also increases the chances that an addiction disorder will occur. Once addicted, there’s a good chance that the user will end up taking the drug for long enough to start experiencing dangerous health effects. Studies indicate that certain anxiety disorders, such as panic disorder and social phobia, are not only worsened, but may also be caused by long-term use of drugs like Ativan. They’re also associated with a phenomenon called “rebounded anxiety” in which a person stops taking the drug, and their symptoms become worse than they were before being prescribed the drug. This anxiety may last for weeks or months, and it may have to be controlled by other medications. After learning of the possible health effects of long-term use of Ativan, people may want to stop taking it. However, it’s not that simple. There are a couple of serious potential withdrawal symptoms that can appear, especially if a person stops taking a benzodiazepine all at once. In severe cases, seizures can be fatal. Suicidal thoughts combined with depression and other emotional symptoms are often the more pressing concerns. Either way, doctors almost always recommend that individuals who have been taking Ativan or a similar drug taper off from the medication over a long period of time to avoid these risks. This tapering approach should be overseen by a physician. What can Ativan use do to the heart and circulatory system? Ativan can also cause heart problems if the person stops taking it suddenly. This can result in heart arrhythmia or even heart attack in some cases. Does Ativan use affect the digestive system? While Ativan generally has mild side effects on the digestive system while taking it, long-term use or withdrawal tell another story. Withdrawal from Ativan or other benzos can cause diarrhea, vomiting, and other types of severe gastrointestinal upset. Often, people who are on long-term courses of drugs like Ativan can also develop symptoms that resemble irritable bowel syndrome and cause extreme discomfort. If this goes on long enough, it can result in damage to the digestive tract. However, it appears these symptoms will improve once withdrawal is complete. Nevertheless, it is not safe to stop taking a short-acting benzo like Ativan without a doctor’s help. Doing so can lead to more severe withdrawal symptoms, such as seizures. For this reason, while quitting cold turkey might seem like the way to go to get past the digestive symptoms quickly, it is safer to follow a doctor’s recommendation for a slow, safe taper off the drug. How does tolerance to Ativan build over time? Tolerance is a condition in which the body gets used to the presence of a drug, such as Ativan, resulting in the drug becoming less effective for the condition it is treating. The National Institute on Drug Abuse describes the result, which is that the individual who is taking the drug begins to notice it doesn’t seem to work as well anymore. This decreased effectiveness sometimes causes people to increase their dosage on their own to manage seemingly worsening symptoms. This can lead to tolerance to the increased dosage, causing the person to increase the dosage again and leading to a cycle that results in tolerance to high doses of the drug. This, in turn, can lead to severe withdrawal symptoms if the individual stops using Ativan suddenly, and some of these symptoms can be fatal. Tolerance to drugs like Ativan can happen very quickly. 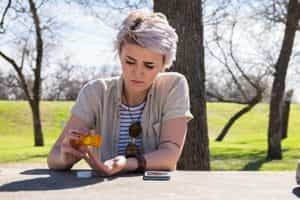 In fact, addiction to benzos occurs in about 40 percent of people who take these drugs for at least six weeks, according to the Royal College of Psychiatrists. This means that lenient prescribing practices and self-treating conditions as described above can quickly lead to dangerous use of this prescription drug. What drugs interact negatively with Ativan? Combining Ativan with any of these substances can result in extremely suppressed breathing and circulation, which in turn can cause the person to become nonresponsive. In particular, combining benzos and opioids or benzos and alcohol is a common cause of overdose in people who use or abuse these drugs.